Born into a politically and socially progressive Quaker family, Anthony became deeply committed to the abolition movement before the Civil War. She was also active in the temperance movement and then in the cause of women’s suffrage after meeting Amelia Bloomer and Elizabeth Cady Stanton. 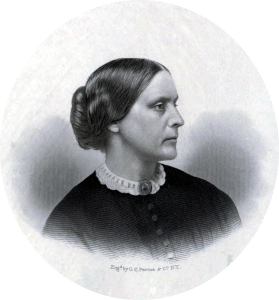 Rebuffed in 1852 when she attempted to speak at a male dominated temperance meeting in Albany, she immediately organized a rival Woman’s New York State Temperance Society and used the organization to campaign for women’s rights.